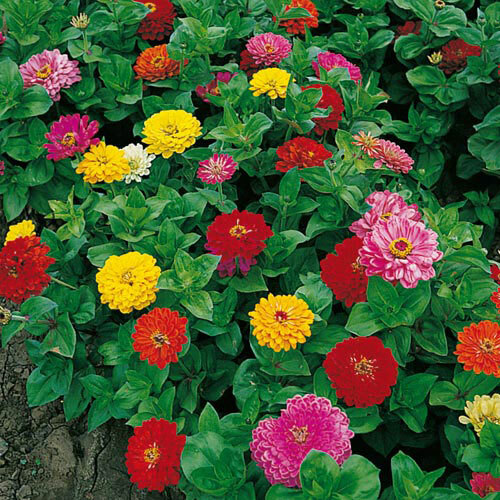 Anniversary Zinnia | Gurney's Seed & Nursery Co. Introduced over 20 years ago and still one of our best sellers! Sunny summer blooms come in all colors and sizes. An economical, exciting addition for your sunny beds and borders. Grows12-24 in. tall; ideal for arrangements. Foliage1.5 - 4 inches long; rough green foliage. Flower FormDouble and semi-double blossoms. Germination5 - 7 days at 70 degrees F.
Soil RequirementsLight, well-fertilized and well-drained soil. Seed CountApproximately 75 seeds per packet. CommentsKeep fertilizing at 3 - 4 week intervals for bigger flowers. Powdery mildew is very common late in the Summer or in wet weather. Our all-time customer favorite. Wide mix of colors and sizes.